Gusworld was there, you should have been too! 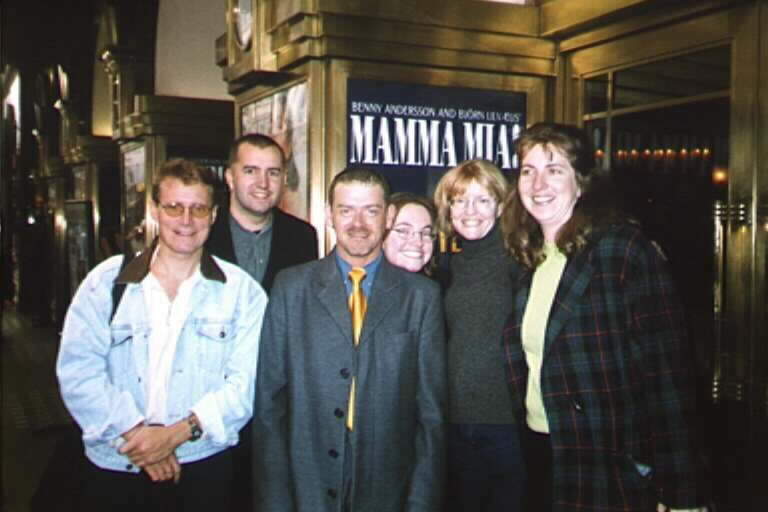 These photos were mostly taken at the March 23 preview for Mamma Mia!, and the April 6 opening night. They're highly unprofessional, but then, trying to take a decent shot in a jostling crowd of 300+ ABBA enthusiasts isn't easy. 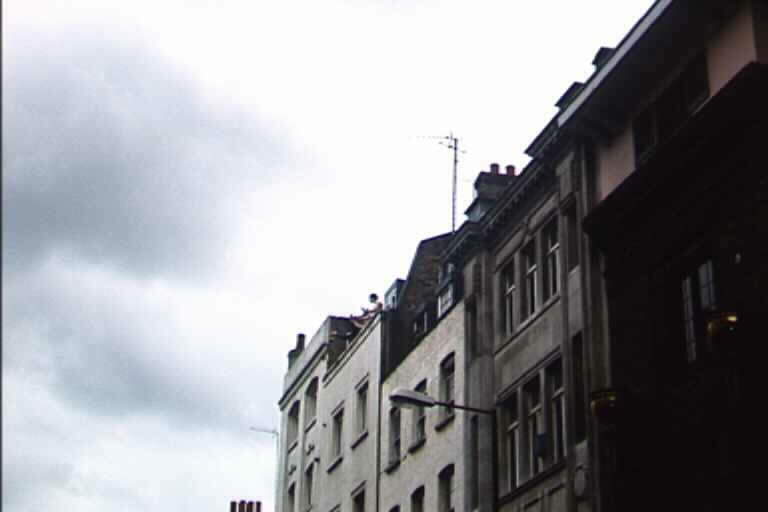 Click on any shot to see a full-size version. 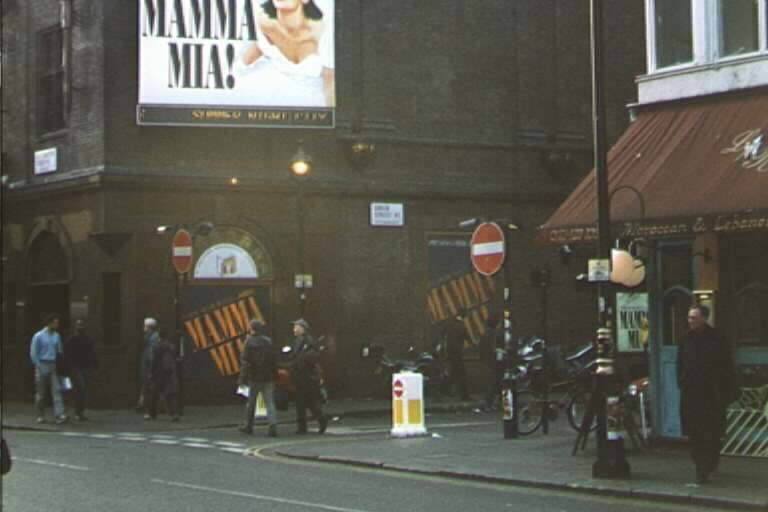 It's a bit hard to explain to a non-fan the excitement I felt just approaching a theatre bedecked in the words 'Mamma Mia', as shown in the first two pictures. 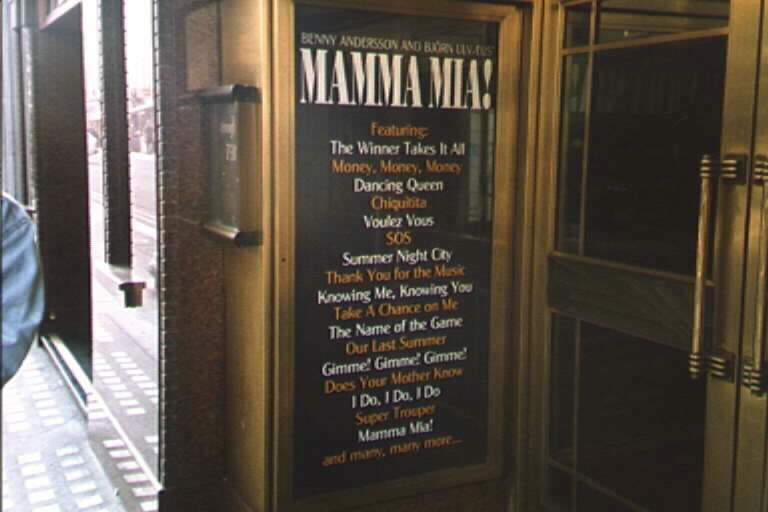 The third shot shows the list of songs in the musical displayed outside the theatre; notice the inclusion of 'Summer Night City', which was dropped during previews. 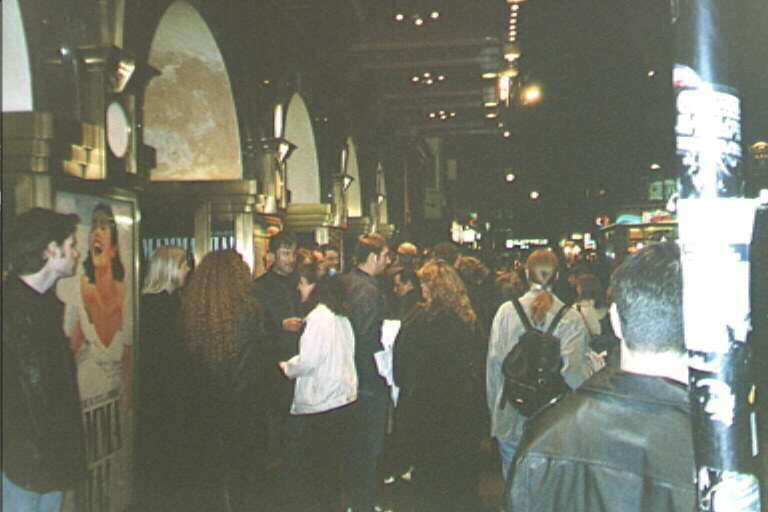 The fourth shows the preview night crowd. 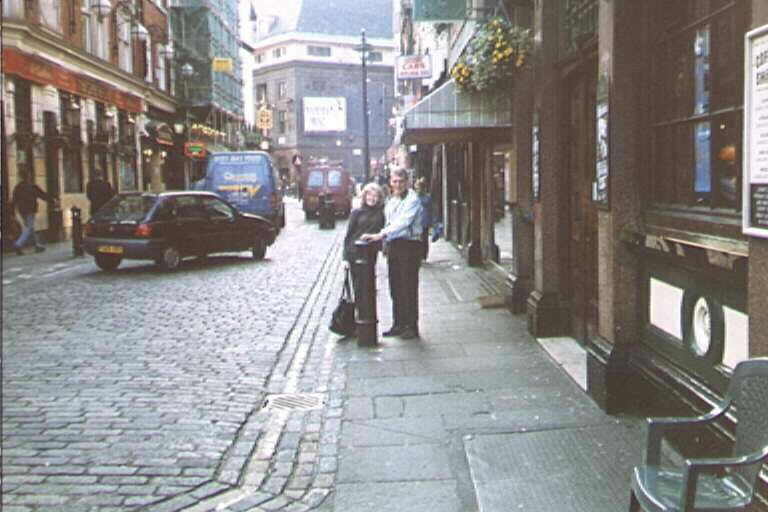 I wasn't the only person to trek from Sydney to Soho for the show, as the first four shots indicate. 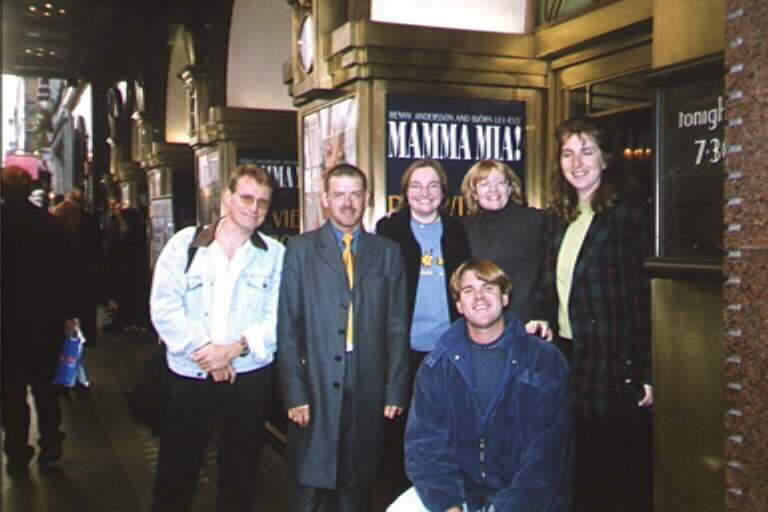 I won't name names (to protect the innocent), except to say that I'm second from the left in the first picture and the camera-hogging redhead in every shot is Cotton Ward, arguably Australia's most famous ABBA fan. 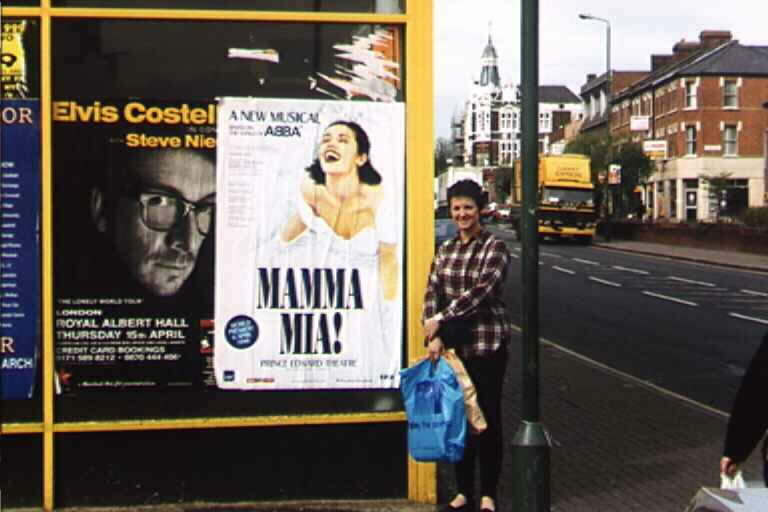 The final shot shows my stepmother, Jenny (who saw the show with me the second time) next to a promotional poster for the show in Leytonstone. 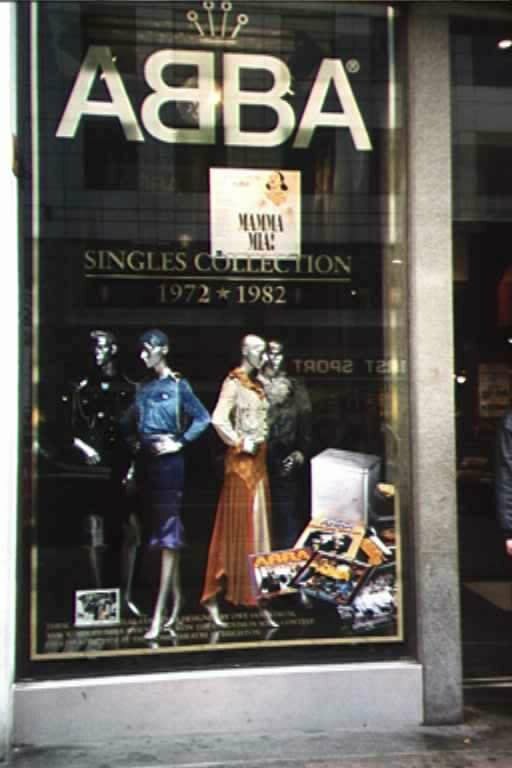 To celebrate the musical, the 25th anniversary of ABBA's Eurovision win with 'Waterloo', and the release of a boxed set containing 29 CD singles, HMV's Oxford Street mounted a window display featuring the original costumes worn by ABBA for Eurovision. 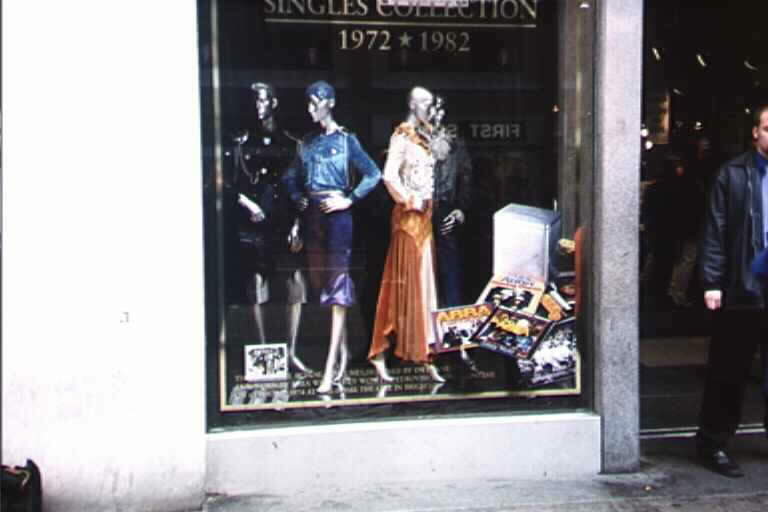 Shame about the mannequins. At 2:00pm when I got to the theatre, there weren't a lot of people around, as the first shot shows. 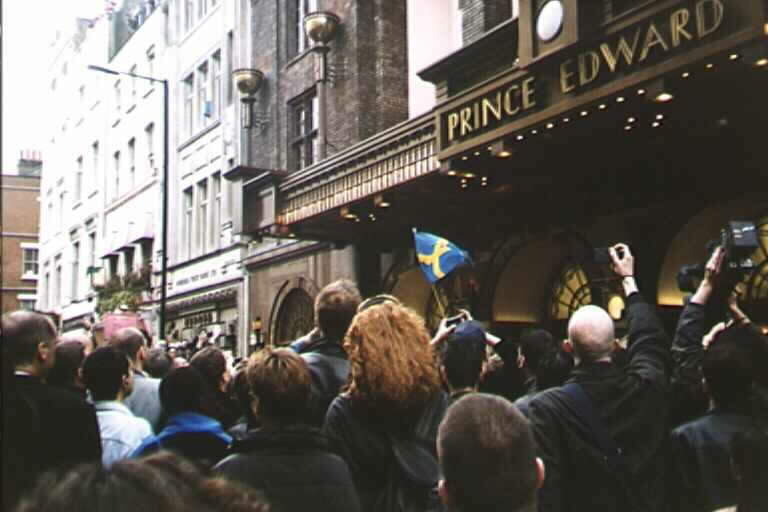 By 5:00pm, though, so many people turned out for the preview that the police had to be called in and Old Compton Street closed off. 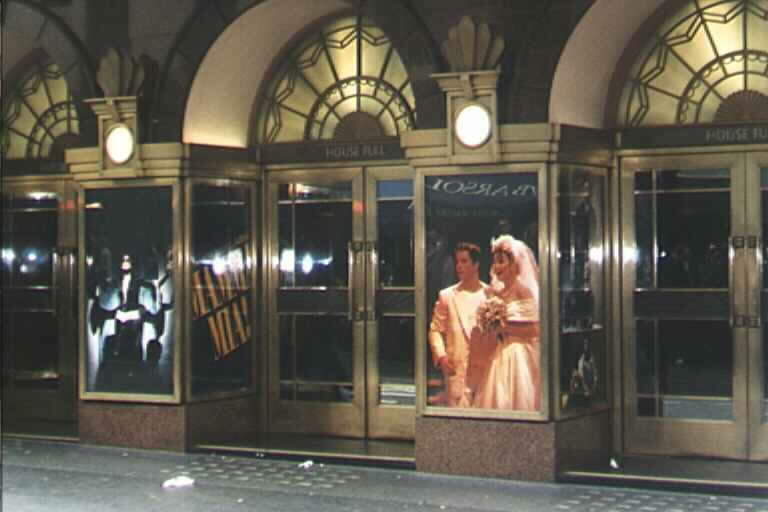 This made taking pics very difficult, but added greatly to the atmosphere. A special area was fenced off for press photographers (see the third pic), but anyone without a stepladder was still in trouble. 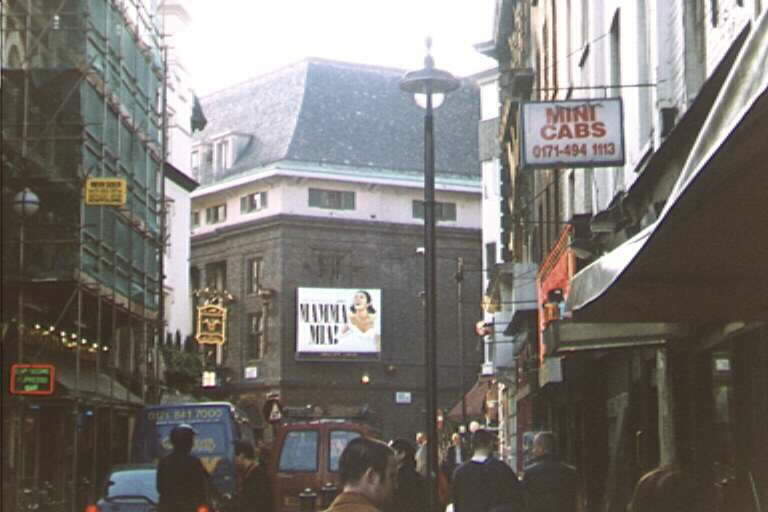 The fourth shot shows a bunch of people living in a high-rise down the road, who began blasting ABBA songs into the street from their stereo while miming along. I have loads more pics of general crowd jostling, mostly as a result of failed attempts to photograph celebs, but I've skipped them here. 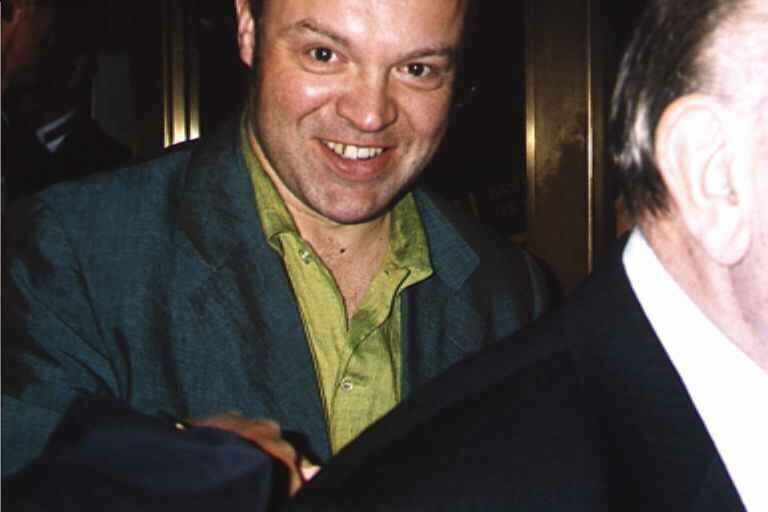 Stars at the opening night included Steps, Stephen Fry and Cleopatra, but getting photos was fairly difficult owing to the priority given to TV cameras. 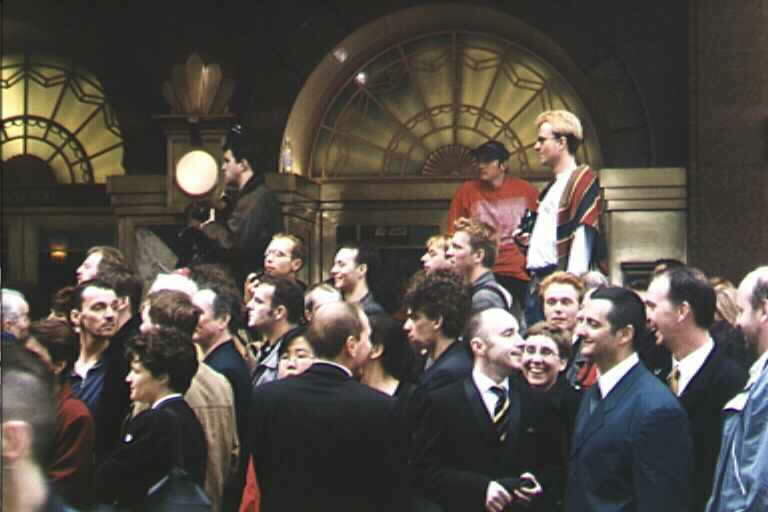 The shot on the left shows Chris Tarrant, the UK host of Who Wants To Be A Millionaire?, lurking in the background; the other is a half-decent shot of chat show compere and stand-up comedian Graham Norton (who favourably reviewed the show on BBC Radio 4 the next day). 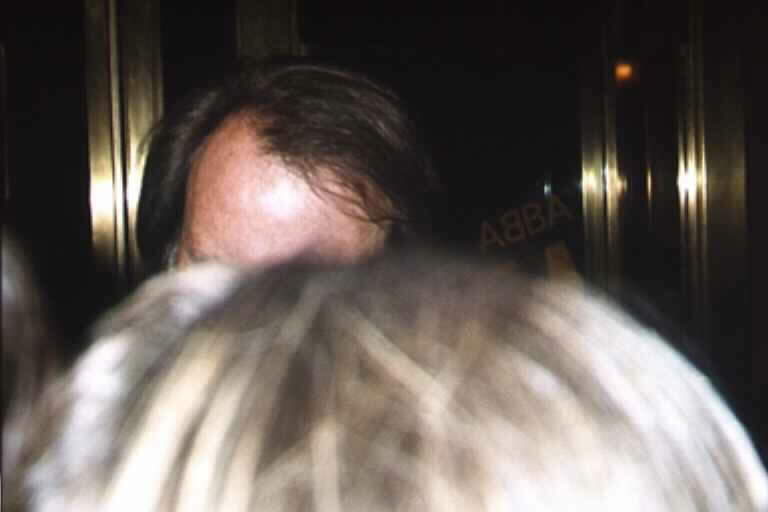 Well, half of ABBA. Rumours that Frida would show proved to be groundless, but the first shot does show Bjorn's current wife, Lena (and yes, she looks a lot like Agentha). 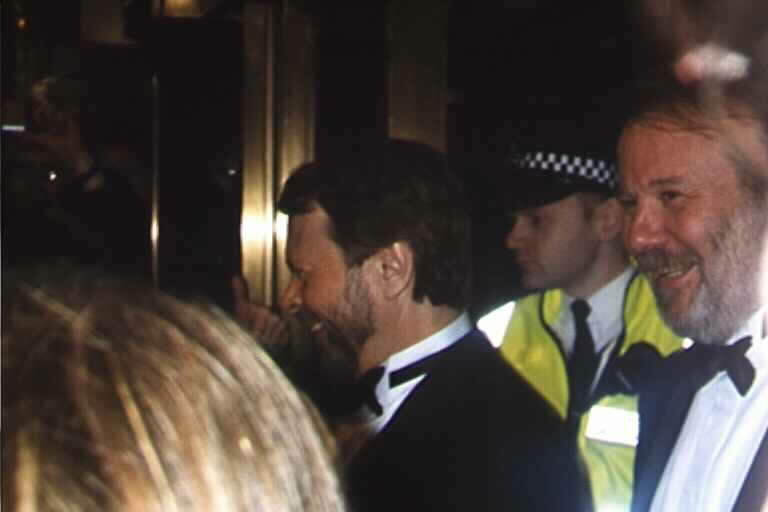 The middle picture basically justified the trip, IMHO, by getting Benny and Bjorn in a single shot as they exited the theatre in triumph. Benny stopped to sign autographs, but my chance for a second decent pic was thwarted by the woman in front of me, who kept jumping up and down.